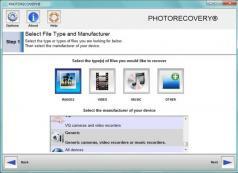 PHOTORECOVERY is a friendly and reliable multimedia file recovery tool that makes it easy to restore deleted photos, videos and music files from one or multiple disk volumes or drives. The program can help you recover files that have been accidentally deleted or removed by other applications from several storage types including memory cards. After you run PHOTORECOVERY you will need to choose if you are trying to recover images, music, videos or various other types of files. It is possible to select multiple options according to your needs. You can also specify the video or music recording device you want to restore data from, camera manufacturer or a backup image file. While the application is scanning for deleted files, you can view the thumbnails of recovered photos and clicking on any item lets you access a preview for the image along related details like resolution, size and creation date. Furthermore, you can pause the scan job at any time, and resume it later.